January 27, 2010 - Cirrus Aircraft announced today the sale of 16 of its 2010 SR20 model aircraft to Purdue University’s Department of Aviation Technology. The 600 students currently enrolled in the Purdue program will utilize the new Cirrus fleet daily to obtain hands-on flying experience, earn a private pilot certificate, instrument rating and ultimately a commercial type rating. "Purdue's choice of Cirrus Aircraft for its training and research programs speaks to its commitment to the best available combination of technology, safety and capability in general aviation,” said Cirrus CEO Brent Wouters. “We, at Cirrus, are very pleased that an institution of Purdue’s global academic and research stature has chosen to partner with us. The new Purdue fleet is just the latest example of an institutional customer choosing Cirrus as its training platform for many of the same reasons that have made Cirrus the most desired airplane in personal aviation." Purdue University conducted a rigorous evaluation process before selecting the aircraft it would use to continue the program’s advancement in training the nation’s future pilots. 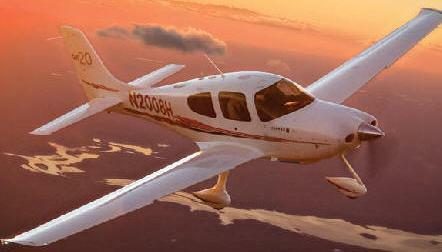 After careful consideration of operating cost, safety, flight characteristics, research capability and proposals from other manufacturers, the university chose the Cirrus SR20. With a whole airframe parachute recovery system as standard equipment, Cirrus is an ideal choice because of its safety features and outstanding safety record. The new SR20's will provide recruiting benefits as well given the natural progression of avionics commonality and flight characteristics leading up to the Embraer Phenom 100, also a part of Purdue's state-of-the-art fleet of training and research aircraft. "The collaboration between Purdue University and Cirrus Aircraft launches a new era of next-generation collegiate aviation education. In approving the acquisition, University Trustees and officials noted the necessity for Purdue to maintain a globally preeminent aviation technology program" said Dr. Brent D. Bowen, Professor and Head of the Department of Aviation Technology at Purdue University. "Our investment in Cirrus and the resulting technologies will provide us with data acquisition and flight training capability never before possible and allow us to advance aviation education to a new level." Each SR20 is equipped with the Cirrus Perspective by Garmin™ avionics platform, Alaka'i Technologies data recorders and Garmin GDL-90 receivers to support ongoing research projects. The first Cirrus SR20 deliveries will take place in March of this year with the last of the 16 aircraft scheduled to arrive on campus in July, replacing the University’s current fleet of Piper Warriors. Purdue University, located in West Lafayette, Ind., is a land-grant university founded in 1869. Purdue has a rich history in aviation, offering its first aviation course in 1911. Purdue is also home to the first university-owned airport, which opened in 1930. Today, Purdue’s Department of Aviation Technology enrolls more than 600 undergraduate and graduate students, offering degree programs in aviation management, aeronautical technology and professional flight. Graduates enter careers with airlines, airport authorities, aerospace manufacturers, corporate aviation and government agencies.